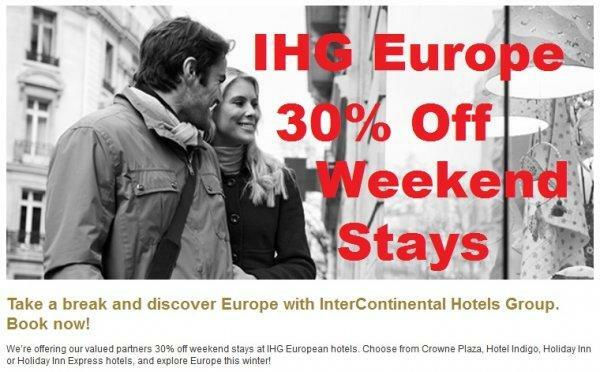 IHG Rewards Club is offering weekend stays at participating hotels in Europe at 30% off of the Best Available Rate. This offer is valid for reservations made by April 6 and consumed by April 27, 2014. This rate requires 21 day advance purchase, is nonrefundable and noncancelable. Make sure that you choose the “Partner Rate 30 Off” from the drop down rate menu. This hotel had the rate plan loaded for a weekend stay. Seems that IHG retired (at least for now) the popular 2-4-1 weekend stay offer for Europe that was available for years and replace it by this 30% off offer that seems to have rather limited participation. Offers applicable for reservations made by 6th April 2014, for hotel stays in the period 7th February 2014 to Sunday 27th April 2014. 30% off Best Flex represents a minimum of 30% off saving against our Best Flexible rate per room, per night for two adults sharing a standard double/twin room (inclusive of VAT). Bookings must be made at least 21 days in advance before the stay date. Stays are available over Friday, Saturday and Sunday nights (however some hotels may also offer limited midweek availability – please check when booking). Member ID or IHG voucher will be required at check-in as a proof of eligibility of this rate. IHG Rewards Club points apply. Offer only available at participating European hotels including Crowne Plaza, Hotel Indigo, Holiday Inn and Holiday Inn Express. All bookings are subject to availability of rooms allocated to this offer at participating hotels. Reservation is for room only, breakfast not included, except for Holiday Inn Express hotels where breakfast is included. Offer valid on new bookings only, full payment must be made at time of booking; no amendments permitted; no refunds will be given. 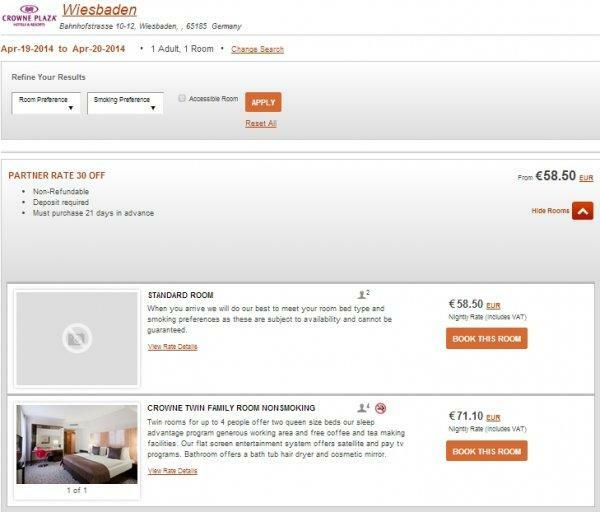 For cancellations of stays at hotels in Germany, a 10% deposit will be returned. This offer cannot be used in conjunction with any other offers or special promotions. This offer cannot be redeemed with IHG Rewards Club points.